After learning the news that I may need an engine rebuild I got to pricing all the replacement hardware. $285 for some rod bolts made me start looking at different rod/piston combo's. Now my goal here is to just rebuild the stock NA motor, stock NA head. It got me looking at the rod specs on the early Mitsubishi 4G63 rods. They are wider than the later rods, which if I read correctly is better to be wider. These are available from a lot of aftermarket companies. 150mm length, 21mm wrist pin, 48mm big end bore, 1.116 big end width. Manley's are $350 from Amazon. I think this part# is correct Manley 14021-4. You would have to widen the journal right? the 4G63 width is 1.116 compared to stock of 1.098. They are for a Toyota 2Y motor and are 40thou over which makes them 87.0mm, have a compression height of 34.7mm and a pin diameter of 22mm. If I team them up with later Mitsubishi 4G63 rods which are 150mm long I'll end up with the same overall length as the NA 924 rods and pistons. One nice plus with the mitsu rods is that the bore is 3.6mm smaller than the 924 rods so I can get the crank offset ground and pick up an extra 3.6mm of stroke. Remember, this is a NA motor I'm building so every little bit counts. Just did the numbers and 87mm pistons with an extra 3.6mm stroke (taking it to 88mm) gives a capacity of 2092.5cc an extra 109cc. Woo Hoo. Dedicated 2618 alloy forgings, offset wrist pins, Nitrided/Napier Steel rings, skirt coatings, complex dish and dome designs, special skirt profiles, and other features insure longevity and power with boosted and nitrous engines. Now I think we can ignore the stroke measurement as its for the Mitsu head right? I'm still learning. So the pistons Peter bought are 34.7mm compression height the Wiseco has a 35mm compression height. Would this cause interference on the NA head? Or could it be made up with gasket? Also what about the head shape/dish etc..? Is there a way to figure that? 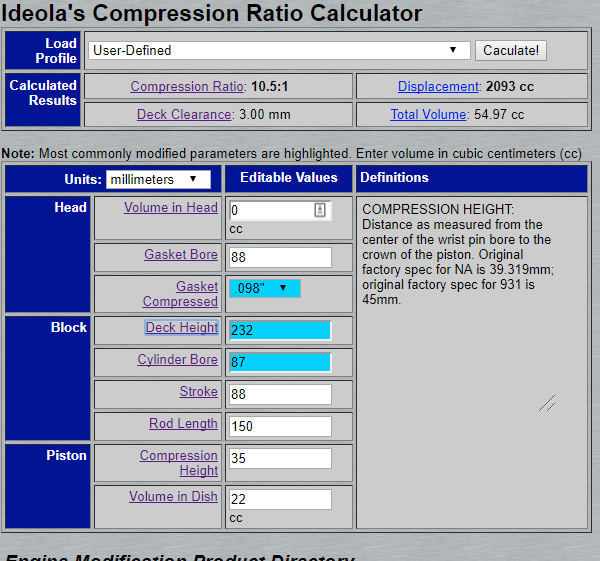 the Wiseco also says 8.5-8.7:1 Compression, does that apply? Now I'm not done. I went and found the OEM for the Mitsubishi piston is Nippon. The part#'s are not that easy to locate but I believe I have found them here: http://www.dashzracing.com/84-86-Mitsubishi-Galant-2-4-Sohc-G64B-Piston-Rings-Set.html for $180!! I do think these are cast pistons, which would probably be fine for a stock NA motor. Pistons, rings, rods and bolts for the cheapo $420! I have a long-term stalled out project that I was going to use the Mitsu rods for. I have a set of Crower billet rods I got in a cyber Monday sale several years back and had a local machine shop regrind the crank to match the rods. They ended up widening slightly and when they ground the crank down, did an offset grind for more stroke. Does a negative dish means the pistons are concave or convex? I haven't purchased pistons yet for my build, so I haven't done a lot of research there yet. Thanks, saw that the other day but brain was full. 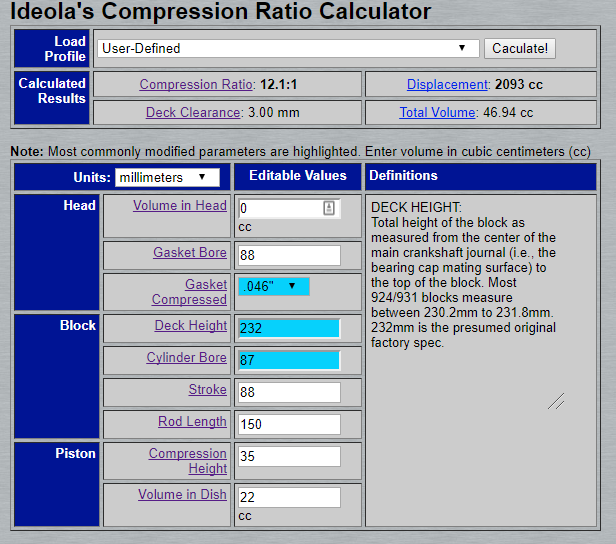 I plugged in the #'s and it looks like compression ratio would be too high with stock head gasket. Any risks with running those thicker gaskets? Is 10.5:1 too high? I want to run regular gas. 12.1 CR isn't that high. It would be pretty good for running on race gas. You might get away with running on 93, but my guess is the combustion chamber isn't designed well enough to keep temperatures low enough to avoid knock. I believe there are several forum members that run high CRs in NA engines. Remember, the higher the CR is, the higher thermal efficiency is in the Otto Cycle. Its proportional to the heat ratio in the thermal efficiency equation. 12:1 is not high at all, high performance street hondas run 13:1 or even higher. This is clearly not a modern high revving engine but it will run great at 12:1 on premium gas. Out of curiosity, could you run the later 4G63 rods on a 924 crank? 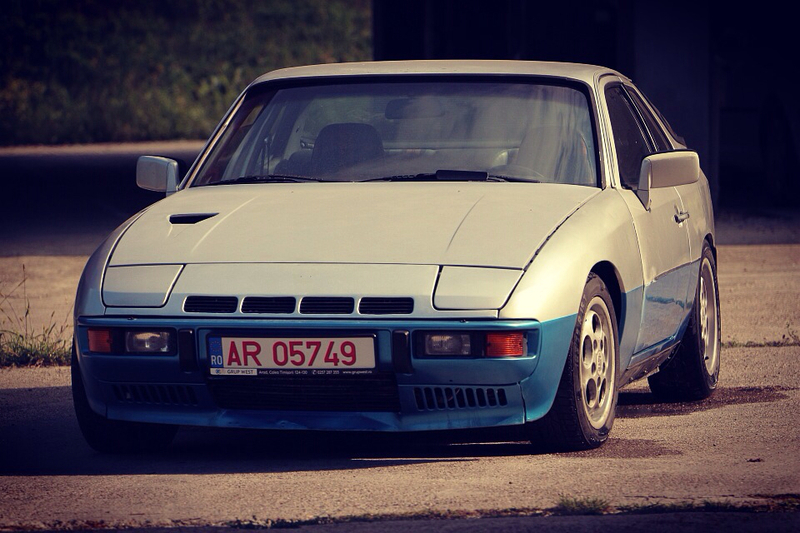 My impression when I was collecting parts was that the later rods were narrower on the big end than stock 924 rods. You would end up having slop, but it looks like Peter was talking about doing that. The difference in width is small. In Dan's thread about the cheap stroker his machinist recommend the wider so that's what I figured. With my 12:1 scenario above I still have valve clearance right? Non-interference. Most modern engines are interference, it isn't a big deal if your engine is an interference engine. Anyone else have any insight on using a narrower rod such as the second gen Mitsu rod like Peter said he was planning to? The problem with pistons isn't the interference, it is the pistons chasing the valves particularly at overlap as exhaust valve is opening when the piston is coming up to it. On my 931S2 pistons that come out flush to the deck I had to cut valve pockets that are 6mm deep which leaves room for exhaust valve growth due to heat. Found some cast pistons at summit that will work. $75 set, no rings though. I bought cheap H-profile rods with bolts from Aliexpress, they make both 944 and 924 rods. Hi! Any updates on those rods?